Guest Post - Guerrilla Mom's Abridged Version of "Healthy Sleep Habits, Happy Child"
While my hand heals, I've asked a few of my favorite bloggers to pick up the reigns. This week's post is from Guerrilla Mom. I was racking my brain for what to write for my Ask Your Dad guest post. Then I remembered that you have a new baby on the way. So I thought, Great! I'll give him some parenting advice! I know you have already done this once before, but heck- there are things that we all fail miserably at the first time around, right? I don't know what your particular failures are - so I'm just going to project. Mine is sleep training. My child will be two in November, and I still have absolutely no idea what his bedtime is. Maybe I shouldn't be giving advice on this subject. 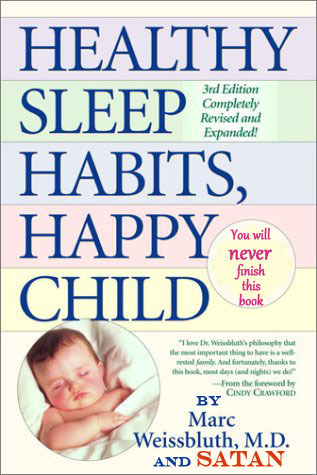 It is an important one though- so in lieu of having you fail in my footsteps - I picked you up a copy of Healthy Sleep Habits, Happy Child. It's five hundred pages long. Okay, so I edited the cover a little. Satan himself wrote it, obviously, because who else would write this advice opus for a NEW PARENT? Five hundred pages. When I was a new parent I barely had time to read the dosage instructions for children's Tylenol. Since I don't think new parents like gifts from Satan, I will be abridging it for your swift reading pleasure. This is my gift to you and your wife. Put your child to bed, and then ignore him for the rest of the night. Were you expecting more? Nope - that's it. Put your child to bed, and ignore him for the rest of the night. That is the recurring lesson in this book. 500 pages just to impart the crappiest advice known to parenting. Which brings me to the real subject of this post - no one knows what the hell they are doing, and no two children are the same. When it comes to parenting, all that we can do is trust our intuition, love our children, and do our best. There is no book that can teach us any of that. It may seem counter-intuitive for a woman who is attempting to make a career out of writing about parenting to say those words - but oh well. You are a great parent. It is evident in your anecdotes and the way to talk about your family. It was made abundantly clear by the amazing note you wrote to your "hypothetically gay son." So when your hand heals up, please keep on doing what you do. And if you have some sleep advice for me, let me know. I'll trust a real dad over some doctor and Satan any day. You can check out more of Maria's awesome mommy blog, or follow her on Twitter and Facebook. P.S. Dad here again. The hand is healing a little each day. I plan on being back in full force after next week! Thanks for sticking around!! Satan also wrote the book on potty training ;)...I agree that each child is different, and because I was imparted with that wisdom from EVERYONE I knew? I totally only had ONE lol! Hey Dad, glad to know you are healing well and quickly! I love this!!! I've never read that book but there are so many out there like it that it's really pathetic. If there's any I learned as a first-time mom, it's that most parenting books are crap and make you feel like crap as a new parent for having the gut feeling that they are crap and won't work for your child. Awesome post! Angeline that cracked me up, I just finished GoT and recommended it to some new parents... hmmm... I see some messed up childhoods in the near future! God, they're so good but way too brutal and traumatizing for a new mum. Became a bit of an ordeal. Hard to tell which was less relaxing, baby or book. Both my husband and I were surprised how much more sensitive we were after we became parents. Watched Raising Arizona again & both spent the whole movie shaking our heads and saying "That's not right. That's just not right. You can't go taking other people's babies." Ha ha ha! Sleep training. The only thing that I have found that works is "Oh, hi! You can't sleep? Good. Fold these washcloths." But that only works when they are 3 1/2. Until then, who knows? Go out to dinner and hope they fall asleep in the car. OH the need for sleep years! All three of mine are teens now. But I remember YEARS of no sleep. They had just come out with the "toss in bed and ignore crying" thing when my first was born. I tried it then had a nice little revelation. IT WON'T LAST FOREVER. So when they cried, I cuddled them. I rocked my middle child to sleep when he needed it. Now they are making up for it...they never STOP sleeping LOL Seriously, those books are BS. Don't hold your child when they ask - why? Why not cuddle them when they need it? My 18 yo was a major cuddler, now I can't get a hug. Set them on a feeding schedule - except for when they sleep they eat nonstop. What schedule?! Let them scream and learn to self - soothe - really? Teach my babies that I won't be there for them when they need me? That I don't have their back? That I can't find the time for them when they need me most? Yeah, I had a cold winter once. Those books came in handy for heating the living room when the heater went out. Only good use that came of them. Yikes! I can't believe how harsh you are to Dr. Weissbluth and to this book. 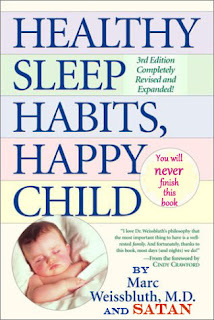 I am a huge fan of Healthy Sleep Habits, Happy Child. Out of all the parenting books I was given, this is the only one I truly loved and recommend to all new moms. I think you were unfair to harp on the fact that's it's 500-pages long and not mention that he has outlines at the end of his chapters so you don't have to read the entire chapter, just the cliff notes. Additionally, he offers multiple options for sleep training even discussing methods for if you co-sleep or don't want to let your baby cry for a period of time. Anyway, it worked for me - my four year old and my three year old both sleep 11-12 hours a night. They don't sleep that long because they've been taught that we don't care or love them, but because we've taught them that sleep is important and it comes at a certain time each night. They get a loving tuck in and if they protest or pop out, they get put back to bed. They can play quietly with toys or read books in bed, but they must stay in bed. They get the structure they need and know what to expect. It's truly a good thing for the ENTIRE family. My husband and I love our down time together after the kids go to bed and if they stay up and play in their beds for 30 minutes or so that's ok too. Sorry, I meant this comment to just be a general comment, not to you specifically. Five Dollar Friday - KaBoom!